The Destination and Visitor Management group recognizes the importance to respect local culture and protect the environment. We aim to give priority to local interests and work to achieve a positive and enjoyable experience for visitors. The group will strive to meet the interests of locals and encourage them to be involved in the decision making process. Why do people want to visit us? … just look around! With picture perfect sunsets (and sunrises) almost year-round and laid-back vibes, Whaingaroa Raglan is hard to beat. Raglan offers pristine surf, mountain trails, epic views and a unique opportunity to connect and care for the environment. Visitors don’t want Raglan to change. There is a connection to Raglan that many feel their own home has lost. The 2017 Raglan Visitor Infrastructure Study (WDC) estimates that Raglan sees around 22,000 visitors each weekend over the November-April ‘summer’ period. The report projected growth in the source populations for visitors from Auckland and Hamilton, and for International tourists arriving at Auckland Airport will be expected to increase tourist numbers in Raglan, at a higher rate of increase than expected growth in the local residential population. Tourism New Zealand has ceased advertising NZ from late December to early March to avoid over-crowding around the country. The International visitor arrivals to NZ: March 2018 report showed an increase of 276K of annual visitors to NZ, a year-end number of 3,819,817 visitors. Whaingaroa Raglan is touted as ‘the jewel of the Waikato’ and is actively promoted by *Hamilton & Waikato Tourism, Tourism NZ and others. Because Raglan is home to some of the best surf in Aotearoa, entities like Surfing New Zealand also occasionally promote Raglan when surf contests are held at Manu Bay. Raglan has been featured in commercials for Air New Zealand and there was a recent spread on Raglan printed in KiaOra Magazine (August 2018), which is Air New Zealand’s in-flight magazine. These specific features were coordinated by Hamilton & Waikato Tourism. The Raglan Chamber of Commerce works closely with Hamilton & Waikato Tourism to ensure they understand our community values, and that they are aware of on-going community projects such as Plastic Bag Free Raglan and Xtreme Zero Wastes new compost programme and other environmental initiatives, as these community projects also affect visitors. The Chamber places a ‘Raglan Naturally’ advert in the Hamilton & Waikato Tourism Visitor Guide each year. Encouraging positive visitor behaviours (i.e. disposing of waste in the correct bins, encouraging the BringYourOwn culture). Opportunity to develop more culturally connected experiences for visitors, implementing more te reo Māori signage throughout the community. 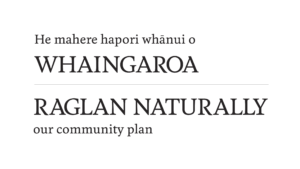 Determining how our community is being promoted by supporting initiatives such as the Whaingaroa Raglan Destination Management Organisation to action the ‘Destination and Visitor Management’ section of Raglan Naturally. Creating seasonal employment for locals, including youth. Tourism training programs can be established to help locals build capacity and skills to help interact with visitors. Highlighting Heritage Trails and utilising harbour cruises to showcase the beauty of our natural environment. Rise in number of AirBNB/holiday homes taking away permanent homes for long-term residents. Communicating to visitors in regards to ‘how to visit Raglan’ e.g., taking a reusable shopping bag to the shops, composting food waste, what to flush, etc. Uncontrolled promotion due to social media. Visitors taking seasonal employment and potential long-term homes. Lack of parking around town and at beaches and surf breaks. Limited services (i.e. police, ambulance, bank services). Rise in visitor numbers – Rise in population – Rise in crime. Seasonality impacts on labour force availability. We are a ‘one-way’ destination. Inconsistent visitor experience across the board / Inconsistent customer service across the board. How does this challenge impact on on Destination & Visitor Management? How does on Destination & Visitor Management impact this challenge? What is the opportunity for us in on Destination & Visitor Management in relation to this challenge? “Within ten years, we will be widely recognised as the eco-friendly heart of New Zealand, and a leading example of responsible and sustainable tourism”. Establishing the ‘Raglan Kaupapa’ Businesses who choose to brand themselves using the name ‘Raglan’ in their business name, should uphold the Raglan kaupapa when operating within the community and when promoting their product outside of the community. Taking into consideration the people, the land, etc. This will give us an opportunity to work more closely with hapu/kamātua… Working with the Business Group to communicate RN Values and ensure businesses understand them. Creating a cohesive marketing message that is focused around sustainable tourism. A ‘how-to visit Raglan’ type of guide. Working alongside the Environmental FB, as well as Xtreme Zero Waste, Whaingaroa Environment Centre and tourism business operators.